It has been the opinion of certain individuals, including several who have made some pretension to an understanding of military affairs, that the Antari army led by Prince Khorobirit was able to attain victory not through some great stroke of tactics, or superior doctrine, by through the superior quality of the fighting men, compared to both the soldiers of His Tierran Majesty’s forces, and the soldiery who made up the armies which the Duke of Wulfram had previously defeated in the campaigns of 602, 603, 604, and 606. These learned personages have made great and incredulous arguments regarding the size and the physickal prowess of Prince Khorobirit’s soldiery. This, they attribute to the harsh climes of Prince Khorobirit’s native holdings, being those at the very northernmost point of creation, an area often subject to harsh frosts and heavy snows. In the opinion of these esteemed gentlemen, such inhospitable conditions had allowed the residents of those regions to grow in stature and musculature, until they possessed the strength of multiple men hailing from more temperate regions. By way of evidence, they point to the prodigious size and strength of the Snow Bears so commonplace in the Northern part of the Calligian continent, as well as the greater bulk of the Wulframite and Aetorian wolves in comparison to its southern cousin, the Kentauri wolverine. Of course, as with most assertions of such magnitude, this argument has been subject to no small amount of opposition, mostly animated by such flimsy arguments as the fact that humans are not, in fact, either wolves nor bears; or the fact that people, as opposed to the aforementioned species of beasts are, in a manner surely contrary to the ironclad rules of logic, generally become more fragile in constitution when they are subject to harsh cold, shorter growing seasons, and constant inundation by snowfall. However, due to the obviously nonsensical nature of such arguments, the proponents of the original hypothesis remain determined to prove themselves correct, striding heroically forward, the laudable image of a school of fish swimming steadily towards the obvious safety of a trawling net. Thus, it is to my deepest, most disconsolate regret that I must conclude that such a hypothesis is complete and utter idiocy. In my study of the first-hand accounts of the battle, and my examinations of those few Antari prisoners taken at Blogia, I must conclude that the soldiers of Khorobirit’s army, from the lowliest serf-conscript to the mightiest Church Hussar, are no larger or stronger than any fighting man of their station might be expected. In fact, in comparison to prisoners taken from previous Antari armies, it seems as if the soldiers of the army at Blogia were somewhat inferior in bodily strength and constitution, a difference which is particularly marked in the poor quality of Khorobirit’s light cavalry. As a result, we must conclude that the strength of Khorobirit’s army came not from the superiority of the individual soldier, but of some greater factor. In many ways, Prince Khorobirit’s army had been organised in the same fashion which Antari armies had always been organised. The materials made available to me by Royal Intelligence claim that Prince Khorobirit began laying the groundwork for his army in the late autumn of 606, sending envoys to his allies with the expectation that they and their vassals would be ready to call their personal forces and assemble by the spring of 607. Individually, these forces varied depending on the wealth of the individual lord, and his commitment to Khorobirit’s cause: some consisted of merely a few dozen troops, while Jugashavil and Noribirit, Khorobirit’s greatest allies, brought with them well over five thousand men each. While the size of these forces varied, their composition did not. Each force was made up of components whose substance and proportions had remained unchanged since the days of Saint Stanislaus six hundred years ago: first, there was the lord himself, accompanied by a small retinue of Church Hussars, who formed the most formidable offensive arm of any Antari army. Then, there came a small force of mounted soldiers, who were to fulfil the role of scouts and if necessary, a secondary striking force. These men were made up of either serfs who had been given the honour of riding a horse into battle, or freeholders; baneless commoners who had nonetheless been allowed a position of some responsibility as educated or skilled craftsmen, scholars, bureaucrats, or professional soldiers. The third proportion was also the one greatest in number, and accounted as feeblest in ability: these were the serf levies, who made up perhaps six or seven men out of ten in any given Antari force. Poorly drilled, ill equipped, and treated with a barbaric lack of consideration by their betters, these wretches were expected to serve as a blocking force, to pin the enemy with their primitive weapons, and if necessary, their bodies, so that the Church Hussars might be given a position advantageous enough to deliver a decisive blow. These poor fellows were not even given the dignity of being led by officers of the blood, instead being placed under the command of baneless freeholders, who were often said to revel in the authority given them by subjecting their charges to the most savage punishments for the smallest perceived infractions. Normally, once these component forces were assembled, each would go into battle under the individual command of their liege lords. This would effectively mean that the army was not so much a unified command as it was multiple warbands, each divided into three parts: the lord commanding his retinue alongside the retinues of his brother-nobles, and his servants directing the corresponding forces of light horse and infantry within their own assemblages. Naturally, this meant that neither concerted reaction to new crises, or the ability to adhere to a single plan of battle were possible, a fact which allowed the Duke of Wulfram a great deal of success against armies organised in such a manner. However, Prince Khorobirit did not allow for such a fractured system of command. According to the account of a prisoner taken in the skirmishes before Blogia, upon assembling his army, Khorobirit declared his intention to create a unified command, with each segment of his army led by a single man. Smaller warbands were to be amalgamated until they were of a size roughly equal to half a Tierran infantry battalion, and each was to likewise be placed under the command of a single officer. It is said that the complaints were both vociferous and numerous. However, the account claims that Khorobirit silenced his opponents by declaring that any lord who disagreed might be free to leave, with the expectation that once the Tierran army had been defeated, he would return and crush each dissenter and distribute their lands, serfs, and the women of their families to those who remained loyal. Mindful of the House of Khorobirit’s prodigious resources and long-standing tendency towards heavy-handedness, three-quarters of the lords fell in line, with the rest choosing to take their chances that Khorobirit would be defeated. Thus, Khorobirit’s army, though somewhat diminished in number, was allowed a unified command, which more than made up for the loss of men with an increase in cohesion. *The stated figures are, of course, nothing more than guesswork. It is entirely possible that such a brazen threat, made by any other man, might well have proven ill-advised. However, Prince Khorobirit not only had his own personal force of will at his disposal, but the might of a family name which had written its name in the annals of Antari history with fire and blood. Prince Mikhail Ioannes Vasili’ik of Khorobirit was not the first member of his family to win infamy by lance and sabre. His ultimate ancestor, Aleksandr of Khorobirit, had served as Saint Stanislaus’ commander of horse, and as a reward, had been made a Prince of the Octovian Empire. Over the course of three centuries, the House of Khorobirit would grow in power until it began to chafe at the restrictions placed upon it by the Imperial government. Desiring to break the bonds of Imperial Law, it was Prince Ivan of Khorobirit who sided with Prince Eugen of Antagia in his rebellion to form what would become the League of Antar. Upon Prince Antagia’s death, Prince Ivan of Khorobirit effectively became the military leader of the rebellion. After taking Octobirit and putting the imperial family to the sword, Prince Khorobirit turned his attention to quashing both remaining pockets loyal to the Eagle Throne, and those few cities which had made the decision to remain neutral during the conflict. Chiefest among these was the city of Kharangia, on the southern coast. It was here that Prince Ivan would make his most salient example: arriving with an army of thirty thousand, he battered down the city’s walls with his cannon, razed the poor quarters of the city to the ground, and then cordoned off those areas of the city containing the citadel and the residences of the baneblooded inhabitants. This done, he systematically put every man, woman, and child caught within the cordon to death, before reducing the citadel to rubble with his heavy guns. To the vassal who he placed in charge of the ruins, he gave the warning that should Kharangia ever rebuild its citadel, that the House of Khorobirit would be obliged to return and raze the city once more. It was to this bloody legacy that Prince Mikhail of Khorobirit was born to, and it was this legacy which he used to back his authority: a standing threat to any who would seek to rouse him, and his house to anger. As the second-born son, Prince Mikhail had originally been groomed as a Church Hussar. Excelling at his martial training, he only ascended to the dignity of Prince Khorobirit upon the death from smallpox of his elder brother Ivan (referred to often as ‘Ivan the Younger’ to avoid confusion with his most celebrated and notorious predecessor). Immediately, the new Prince Khorobirit began cementing his position by securing alliances through marriage: to the house of Jugashavil through his sister; and Noribirit, through his own marriage. It was from these two allied houses from which Khorobirit drew his commander of infantry and light cavalry. Neither Prince Ivan of Jugashavil or Prince Konstantin of Noribirit had possessed any military experience before being appointed to command great portions of Prince Khorobirit’s army. However, Jugashavil had at least been known as a capable leader of men. During his grand tour of the Calligian continent, Lord Arthur d’al Havenport, the current Duke of Havenport and Lieutenant-General, recorded that Jugashavil’s serfs were accounted to be particularly loyal, despite the harsh climes in which they lived, and the dangerous nature of the iron mines which the majority were required to labour within. It was said that this loyalty came from the Prince’s supreme level of self-possession, and a superb sense of when to reward and when to punish. This would become particularly important during the middle phase of the battle, as Jugashavil was not only placed in charge of Khorobirit’s infantry, but its supporting artillery as well, and the conduct of both of these forces during the battle itself were likely a direct result of the orders of Prince Jugashavil himself. Prince Konstantin of Noribirit was a different story. He had been much opposed to the marriage of his older sister to Prince Khorobirit, and for much of the war, Noribirit had served mostly as an ally of convenience for Prince Khorobirit within the League Congress. Bellicose and impulsive, Noribirit was a staunch member of the Congress’ war faction, but according to Royal Intelligence reports, Noribirit held a great personal dislike for his brother-by-marriage. When it was learned that Khorobirit had appointed him commander of the light cavalry, it was considered possible that the post was a gesture of reconciliation. Now, we know that it was nothing of the sort, and that most likely, Khorobirit had used the appointment to ensure, or at least render probable, Norobirit’s death in battle, so that he might be replaced by his more agreeable younger brother, Lord Andrei. The League of Antar, of course, has neither standing army, nor regular infantry with standardised equipment. However, that does not mean that the members of its armies are not equipped along certain rough models, dependent on their positions and social class. Speaking in roughly general terms, it can be stated of the Antari that the equipment of their most formidable and best-regarded troops – their heavy cavalry – is as superior to their Tierran counterparts as the weaponry of their lowliest soldiers -the serf-conscript – is inferior to our own line infantry. The result is that while the main weapon of the Antari infantry is the sheer weight of their numbers, their Church Hussars field equipment which is far superior to that carried by any of His Tierran Majesty’s forces, save for those Knights of the Order-Militant who chose to take the field in sword and armour. In the recent history of the Infinite Sea, there have been few men who have found themselves unfortunate enough to take the field of battle more poorly equipped than a member of an Antari serf-levy. While first-hand accounts have noted some numbers of Antari serf-conscripts carrying implements specifically designed for war, usually in the form of pollaxes, spears, or crude pistols and muskets, the vast majority of the enormous number of Antari peasant infantry at Blogia marched into battle armed with nothing more warlike than improvised farm implements, the most common of which was a modified scythe, with the curved blade detached, beaten straight, and refashioned into a sort of pole-arm much resembling the long-bladed ceremonial spears sometimes used by Takaran Provincial Militia as a badge of rank. However, unlike those purely ornamental devices, these rather primitive weapons still proved somewhat effective as lethal implements, theoretically allowing a peasant soldier to stand off against oncoming attackers as if he had been armed with a musket and bayonet. Of course, the complete lack of training characteristic of the Antari peasant levy meant that whatever the merits of the weapon itself, they were wasted in the hands of men who had not the faintest idea on how to use them to their advantage. The equipment of the professional freeholder-soldiers who led the Antari infantry were of an entirely different class. Unlike their charges, it is generally recorded that these men were both armed and armoured with what might be considered proper implements of war, and trained in their use. Among the Antari, such weapons and accoutrements are not issued by any higher power, but serve as personal heirlooms, passed down from father to son as an instrument of their trade. Light sabres and pollaxes were noted to have seen particularly heavy use in the hands of these men, and some were noted to have been wearing jackets of maille, or coat-of-plate, which was noted to be quite ample protection against the light swords of our infantry officers, and even against the bayonets of our line infantry. Artillery has been a valuable arm for armies upon the Calligian continent for centuries. However, the focuses of Antari warfare have meant that heavy guns are almost entirely relegated to use as siege weapons, against fortified towns and castles. Thus, the state of the art in regards to field artillery among the armies of the League of Antar has always been woefully inadequate. Khorobirit’s army was no exception to this rule: unlike the lighter Takaran-style carriages and barrels used by the forces of His Tierran Majesty, the ‘field pieces’ which the Antari brought to Blogia were nothing more than the lightest pieces of Prince Khorobirit’s siege train, taken apart and placed on primitive carriages for transport, and then assembled on site. While they possessed superior range and threw heavier shot than even the heaviest twelve-pounder field guns utilised by the King’s Army, they were effectively immobile when deployed, and required crews of up to fifty to load, aim, and fire. The League of Antar has been traditionally known for the quality and ferocity of its light cavalry. Indeed, the recountings of the life of Saint Stanislaus are filled with tales of his dealings with the Oberlinder Horsemen of the Great Central Plains: swift and free-spirited men atop ponies bred for agility and stamina, fierce fighters who submitted only only to those who they respected, first-class swordsmen and lancers. The horsemen which Prince Khorobirit had brought south with them could not have been any different. Lacking the vast pastures of Central Antar, the light cavalry of Khorobirit and his allies were often little more than serfs mounted atop plough horses or other animals which even even those most unschooled in horses would consider unsuitable for warfare. Nonetheless, the majority of this large and ill-mounted body of horse had been given some consideration in armament: most were armed with some sort of short lance or sabre, and the accounts of the Duke of Cunaris recorded that enough were armed with pistols or carbines to direct heavy, if ragged volleys at his dragoons. Khorobirit’s light cavalry might have only been rendered a respectable force by their sheer number, but that was certainly not the case of Khorobirit’s heavy cavalry. The Church Hussar was the strong right arm of any Antari army, and Khorobirit’s was no different. The most salient parts of a Church Hussar’s accoutrements are well-known to most who possess any passing familiarity with the Antari way of war: a heavy lance with a bane-runed point capable of piercing the most heavily built and carefully enchanted armour; and a pair of steel and leather arcs adorned with eagle feathers and fashioned in the shape of wings. In the opening stages of a charge, these wings would be extended by the use of a spring-loaded mechanism. Aside from the obvious purpose of intimidation, there have been accounts noting that when air passes through a pair of extended wings at great speed, the wings emit a high-pitched shrieking sound, unsettling to both unseasoned soldiery and horses alike. The armour which these wings are bolted to are in some ways much like the suits of plate worn by our Knights of the Orders-Militant. These harnesses – made up of many small pieces of baneruned steel, joined together by an undercoat of leather and maille to create a relatively flexible suit of armour – confers its wearer the same sort of protection against mundane weaponry and musketry as the armour worn by Knights of the Red. However, unlike the plate worn by a Tierran knight, these suits are not fitted to the individual wearer, but are instead family heirlooms, passed down from father to son, much as a barony might be in Tierra: a process made considerably easier by the greater simplicity of resizing Hussar armour for a new wearer, given the small size of the individual plates comprising such a suit. In addition to the heavy lance, the armament of a Church Hussar often includes pistols, daggers, and at least one further baneruned weapon, usually a sabre or a hatchet with a blade enruned to take on the aspect of fire, ice, or lightning. This is necessitated by the fact that upon impact, the un-reinforced wooden shaft of the Hussar lance is likely to break off in the body of its victim. 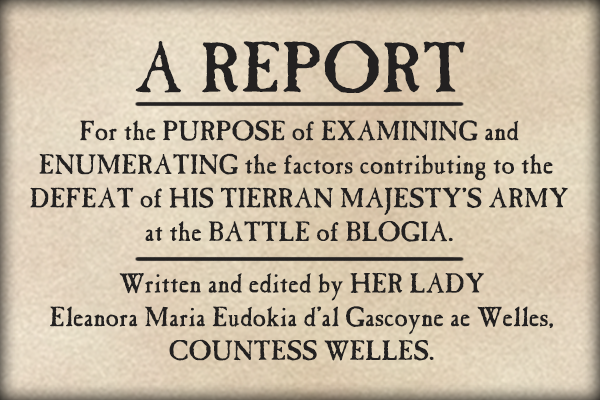 Records of the Knights of the Orders-Succorant present at Blogia have made note of bodies transfixed by the broken tips of Hussar lances, yet still alive: the remnants of the lance being the only thing keeping the subject’s vital organs and fluids in place. Being objects of no small value, most Hussar lance-points are etched with identifying marks, to assist the original owner in recovering the point and refitting it onto a new haft. Following the battle, An emissary from Prince Khorobirit, presented himself at Noringia to lodge a protest before His Tierran Majesty, then newly-arrived in Antar, regarding a number of lance points which had been taken from the field by His Majesty’s soldiers and surgeons, either as trophies or embedded in the bodies of the wounded, a practise contrary to the Antari customs of war. Given the circumstances, it is perhaps quite understandable that this emissary was dismissed without an audience.